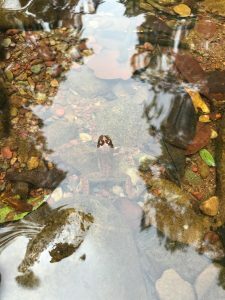 Unlike old days, in Bangalore, let alone seeing butterflies, birds or frogs at our backyard, even holding a fist full of sand has become impossible. Being in the concrete world, the opportunity to introduce growing children to nature’s flora and fauna is very limited. When given an opportunity, we never miss the chance to take our child close to nature. So was the case when we planned our vacation to coastal Karnataka. We shortlisted Wild Wood Spa and Resort at Kundapura as it was also closer to Malpe Beach, Udupi. 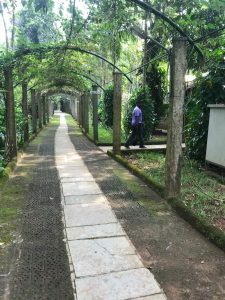 Our stay at Wild Wood Spa and Resort at Kundapura was the best stay so far. Spread across 23 acres of land, the resort houses around 6000 species of various medicinal and other plants. Adjoined to this 23 acres of land is Kosalli river. The beautiful luxury cottages surrounded by greenery, facing the Kosalli river, is very welcoming. It was 12-hour drive from Bangalore. As we reached the place we were astounded by the huge space, calmness, a rustic styled architecture, homely and very welcoming staff. For children it is like letting a bird out of the cage. As we reached the place, the 12- hour drive dint seem to deter us as well as our 3-year-old Nishant to indulge in nature. He immediately got on his feet and started exploring the place. 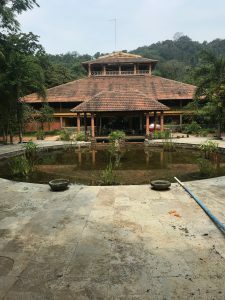 In front of the reception area is a huge fish pond and children can feed the fish with puffed rice provided by them. Nishant just enjoyed feeding and watching the fishes. 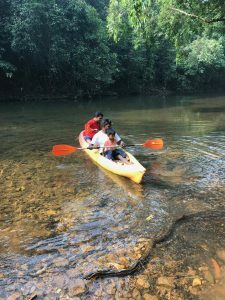 As we proceeded to our cottage, the Kosalli river adjoining to the property and facing our cottages was a sweet surprise. They have a good swimming pool including a good toddler pool. They also have huge play area for children. The cottages are clean and well maintained. The staffs are very friendly and catered to special food needs for the child. 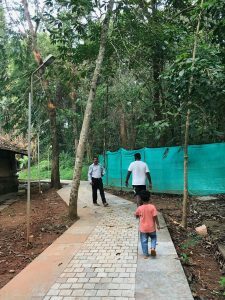 Walking around the space: It’s a huge space and you can take your child for a walk and introduce child to the flora and fauna and let them explore. Nature walk: Botanist introduced us to various medicinal plants. You can let child to touch and smell the various medicinal plants and also understand health benefits of the same. Kosalli river: Although children enjoy the swimming pool (which is available even in Bangalore), one can introduce child to the river. The river is not deep and one can stand and feel the river current (It is seasonal though). For toddlers let them touch and play with pebbles and stones. Let them get wet in the flowing river water. Let them enjoy watching the small fishes and frogs at the river bank. 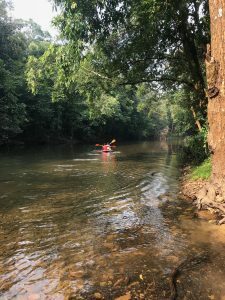 Kayakking: As the river is shallow, I took Nishant kayaking. He just enjoyed it thoroughly. Play Area: They have huge play area with a mini library and trampoline too. 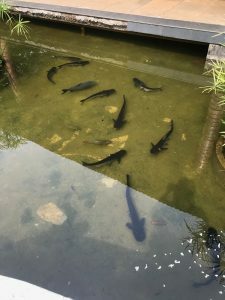 Fish pond: Feeding the fishes with the puffed rice provided by the staff. Children just loved feeding fishes. Cycling: They also provided cycles for older children and adults. So go cycling! The best part of the resort is, it is not commercialised and they have maintained the natural flora and fauna as it is. While exploring the place one can find frogs, small crabs, beautiful birds chirping, spider webs, butterflies around. It is as good as staying in a mini forest.